Pork and beans = #relationshipgoals. Celebrity Chef Mark McEwan gives us his unique spin on the perfect pair, taking prosciutto and lentils and adding in skinless sea bass. According to him, the recipe is designed so that the prosciutto keeps the fish moist and provides an extra layer of skin to it. We're sold. Combine the vegetables and garlic in a saucepan, add the oil, and cook over medium heat, stirring often until vegetables are completely wilted. Add 4 Roma tomatoes yields 1 cup (250 mL) concassè. Blanch Roma tomatoes and shock in ice water. Peel and quarter. Remove tops, seeds, and pulp. Cut flesh into fine dice or diamond shape. Preheat oven to 375°F (190°C). Sweat the onion in a half of olive oil until it begins to wilt. Add the garlic and cook a minute longer. Stir in the lentils and chicken stock; bring to a simmer, and then cover. Cook until just tender—20 to 30 minutes. Meanwhile, cut each fillet of fish in half crosswise and season lightly on all sides. Arrange slices of prosciutto in two overlapping sets, stack a pair of fish fillets on top of each—skin side out and thickest part against thinnest to ensure even cooking—and then roll them into neat packages. Heat on ovenproof skillets over medium heat and melt the butter in the remaining olive oil. 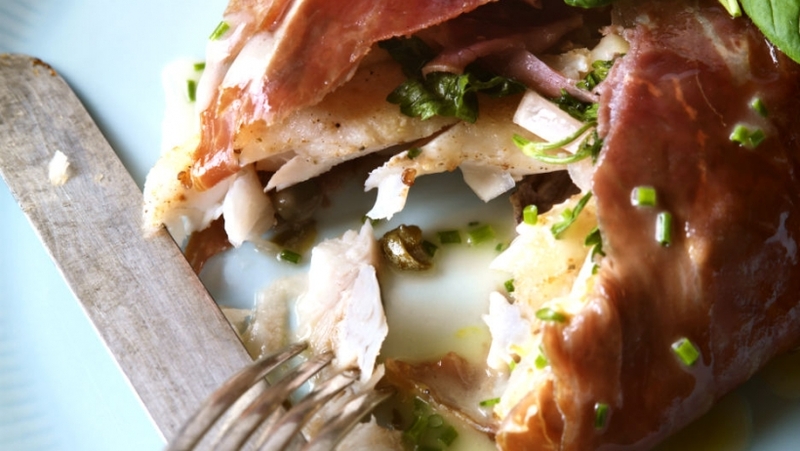 Cook the fish on one side until the prosciutto is crisp and beginning to brown –2 to 3 minutes. Then flip the two parcels, cookfor a minute longer, and transfer the skillet to the oven to finish cooking –about 10 minutes. It shouldfeel firm to the touch when done. Set the fish aside to rest. Reheat the lentils. They should be moist but not soupy, so drain off any liquid if necessary. Stir in the soffritto, scallion, tomato concassè, and parsley. Remove from the heat and fold in 1 tbsp (15mL) of the whipped butter. Correct the seasonings, and then mound the lentils in the centre of two warm plates. Slice the bass parcels in two diagonally and prop the two halves against each other on top of the two portions of lentils. Return the skillet in which the fish was cooked to medium- high heat, add the Tabasco and Worcestershire sauces and lemon juice, and foam briefly. Remove from the heat and add the capers, remaining whipped butter, and a pinch of salt and pepper, swirl the pan well, and pour the emulsified sauce over the fish. Garnish and serve. Tip: You may use ordinary butter in place of the whipped butter to make the sauce; the emulsification will not be the same, but the flavour components will otherwise all be there.